Bonnie's PAF this week was to do one of three challenges; I have chosen "Hidden in Plain View" - with no texture. Photos were taken with my iPhone4 so lends to a bit of texture regardless. The right half of the bottom of the top half (got that?) is of the Turnagain Arm road that we always take from Anchorage to the Kenai Peninsula - amazing beauty abounds and I have taken fabulous "shots" on this drive as we prepare to enter the mountains and Turnagain Pass to the "Y" which leads us to Seward or Soldotna/Kenai/Homer. I chose to hide Ringo, my youngest daughters beautiful pet who just passed a week before Christmas. The "hiding" could have been a bit more, but I wanted to make sure that my granddaughters wouldn't miss it. 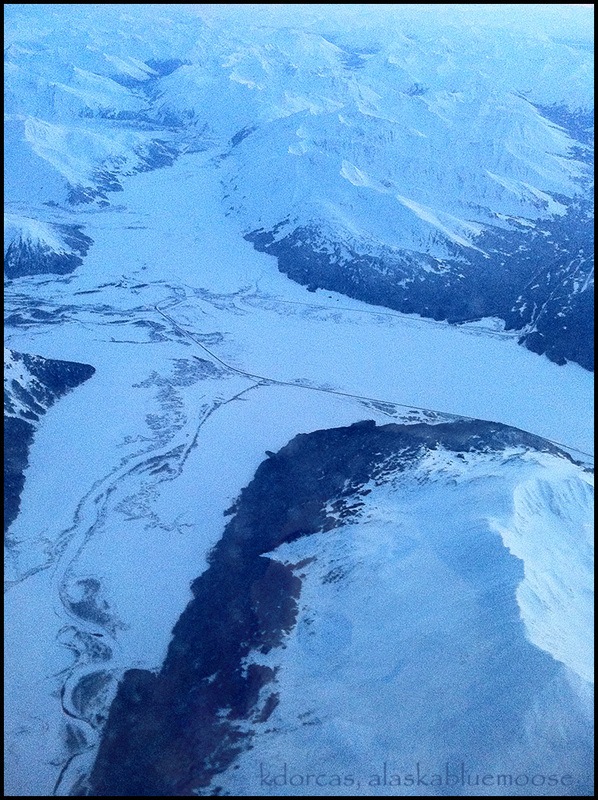 Click here to see a view from the road as one drives around Turnagain. Karen, this is fantastic, and Ringo looks just beautiful. I am sure your daughter and granddaughters will love this. It is very special indeed. Stunning scenery, indeed! Beautiful image and a lovely tribute to Ringo. I have to agree, this is beautiful scenery. Top job Karen! magnificent Karen, and indeed, it is a lovely tribute to Ringo! Stunning scene and beautiful tribute to Ringo. Wonderful scene! I love the colors, and as the comments above,- a great tribute to Ringo! Wow that's some road and scenery! What a gorgeous view. - I love the hidden element, so very special. Beautiful, snowy landscape. What a perfect tribute to Ringo's memory. Beautiful photo, great view, excellent exquisitely soft tones. Greetings. Wow, what a great job hiding in plain view! Stunning job! A very sweet post for your youngest daughter!! lol, I see him. :) nice flight shot. but I apparently had a much harder time finding Ringo than everyone else. This is very beautiful and a lovely tribute to Ringo. Such magnificent beauty! I now see Ringo in the image. Would not have seen if you didn't post your workflow. A nice tribute for Ringo! Wow...beautiful. What a wonderful tribute to your granddaughters beloved dog. I really had to look, but found him.